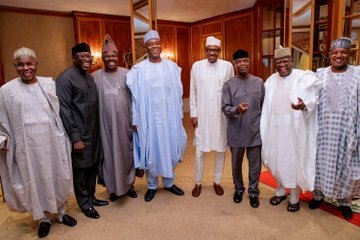 dejiolaluweblog: Opinion: Nigeria Presidency And Its Baggage Of Ethnic Ascendancy: Breaking The Vicious Circle. 0 Opinion: Nigeria Presidency And Its Baggage Of Ethnic Ascendancy: Breaking The Vicious Circle. With as little efforts, I believe discerning Nigerians must have noticed a disturbing trends that usually accompany the emergence of every Nigerian president. It is, however, more prominent in this democratic era than in military era. bigots especially from the north taking laws into their hands at every pretences possible with attendant lost of lives and properties. Perhaps those are symptomatic evidence of the disease which has now gone completely out of hand. Since the return of Nigeria to democracy in 1999, every Nigerian president beginning with Chief Olusegun Obasanjo’s tenure has been tainted with a viral expression of ethnic ascendancies which range from moderate to somewhat embarrassingly primordial, violent, and hegemonistic tendencies. While there’s nothing wrong with every attempt to own the president of this country by his ethnic stock of origin. It should, however, be done with a measure of civility and political maturity which comes not only in short supply in the country but ethnically varied. So far, it’s been more of a reactionary, bestial and bullying lows than something of a celebratory spontaneity which is the global standard at least in the saner climes. Going down memory lane, shall we start from the mild and then move slowly to the absolute appalling of scenarios ethnic feeling of arrival. Like I said earlier that the phenomenon cannot be restricted to this democratic era; nevertheless, I’ll limit my attention to those of recent years because it provide enough instances to prove my case.. In a minor incident midway into the tenure of Chief Olusegun Obasanjo, I remember a land dispute between the Aworis and the Egbas. Yes the matter was debated forth and back albeit with some heat in the public domain but never allowed to degenerate into complete breakdown of law and order. But at a point, to proof the futility of the case going the way of the Aworis, the Egbas had to quietly proudly invoke the fact that their Son was the substantive president of Nigeria; therefore there is nothing the Aworis can do. Of course, the matter in question died a natural death and nothing was heard about it again. Even in the wider context of inter ethnic relations during period in review, I do not think the Yorubas have ever descended so low as to openly covert death, blood and destruction of life and property nationally. Though there were pockets of clashes with the Hausas in places like Ijebu-Ode and Lagos environs; the Yorubas cannot be said to have triggered them. I know the Aworis got the humour clothed gist and they all had a good laugh over it. In any case, there was never a time during the dispute that the Egbas resorted to making sweeping threat statements. Almost everyone can successfully argue it that the Yorubas are almost too enlightened, too cultured, too accommodating to make inflammatory statements as to allude to killing others to prove their ascendancy. Political or royal ascendancy has always been proverbially couched in such a way to make it look less the summon bonum of human existence by the Yorubas. Hence they say : Being without a title is sweeter than all titles bestowed by strife. But shortly after the ascension of president Goodluck Ebele Jonathan, I noticed that the average Niger deltans become suddenly more vociferous threatening to set the Nigerian house on fire should anything bad happened to their son. In view of both the earlier opposition to his presidency shortly after the death of president Yaradua by the still agonising north which believe it was their turn to produce the president. There were spurious allegation of plots to poison him by the aggrieved north which cannot be discountenanced if events in our recent history are anything to go by. In a similar vein, there was a surprising uproar when he was removed from the office through the ballot box by the south-south s a region. Conspiracy was alleged between the north and the south west to remove their son from the office. Ever since there has been an increase in the activities of the militants in that region threatening to bring the economy of the country to its knees by destroying oil and gas pipelines strategic to the country’s survival. All this is happening some people believed because the Niger deltans are determine to repay the north in their own coin. The Niger deltans have always insisted that the Boko haram insurgency was a planned, deliberate creation to trouble the presidency of their son, Goodluck Ebele Jonathan by the north. While this may not be true considering the fact that Boko Haram issue still continue till today, but is being decisively dealt with by this administration. Backgrounding perspectives on this problem and the challenge it poses to the peace, progress and stability of this country will not be complete without citing an article written by Mr Femi Fani-Kayode titled: Araba, Ndi Igbo: Give Me Your Land or Your Blood, which served as an added impetus towards the writing of this piece. In the said article, he sampled two pathetically reprehensible pieces written by two monstrous northern elements of Hausa-Fulani stock where bold faced attempts were made at echoing an age long and extant contempt in which the Hausa-Fulanis steeped the rest of other ethnic nationalities in the country. Written at different times; precisely, the first was written in 2014, while the second was a creation as recent as only a month or so ago. But they both shared the same condemnable characteristics in the sense that blood-curdling threats were issued to anybody or group(s) in the country trying to relegate their constituency to political backwaters. Other chilling agenda prominent in the extracted texts featured ambitious desire to have the rest of the country’s greenbelt as grazing reserve and anybody who opposes it will be slaughter like chicken or cow if you like. Anything short of this and they will not hesitate to turn the entire country into another scene of war in Africa. In another distasteful manner thinkable one of the uncultured writers called an elective serving chief executive officer of a south western state a swine. And the Yoruba race he referred to as chicken-hearted and will not spared in their hideous ethnic cleansing plot. Finally, the writer in question with some deathly glee talked about the Mujahideen being always ready. Evidently the imports of the statement were clear to all discerning peace loving Nigerians. As such its been a subject of viral debate on-line and off-line. Though the problem of killer herdsmen is one that has been on long before the ascension to power of current president. But that did not dissuade his antagonists from trying to find a direct link with the coming of an Hausa-Fulani president in the person of Muhammadu Buhari. More so because mention was made by the writers to the fact that the president was here to serve their purpose. So far, he went further to say that only twenty percent of demands made to the president regarding this has yet been met. What they were, still, remains a subject of analytical conjectures for most public affairs analysts. With all this happening it clearly afforded people like Femi Fani Kayode and his co-travellers to insist almost hysterically that the president is an ultra conservative hegemonist and directly fuelling these killings by the herdsmen particularly. Confessions were made also to the fact that Hausa-Fulanis are eternally incapable of competing with the south in many areas which includes but not limited to economic power. In this wise, national political office such as the presidency should be theirs with the right of first refusal. Who else thinks this way if not people lost on the reality of the human and natural potentials endowed in the six geopolitical regions in the country. While I do not think emerging leaders at no time do have any direct connections with their ethnic nationalities making death threats to others. I, however, strongly feet it was occasioned by the people’s wrong perception of political power. Which takes me to the all important question: How do we break this vicious circle? Here are some of my candid thoughts and opinion on how best to deal with the problem. The first on my mind definitely is education. I believe that the more a people become educated the more they are able conduct themselves in the most civil and sophisticated manners. It’s no gainsaying that the northern Nigeria is seriously lagging behind other regions in all educational development index. To bridge the gap, mass action in this area must be given the needed push as this will bring about the expected attitudinal change among the citizenry. Secondly, I will suggest the immediate adoption of fiscal federalism. This certainly will help take the shine off the central authority and whoever might be occupying the exalted position of the president. The obsessive attraction to the office is part of what is creating problem for the country. Lastly, I will suggest the timely adoption of rotational presidency. If possible it should be made a six year one term tenure so that the position can go round without much delay. Opinion: Re: The Cartoon Loving President. Opinion: Hypocrisy Of The Nigerian Football Fans!